My copy of the collected verses of A.B. “Banjo” Paterson has money as a bookmark. It’s an Australian $10 note, and the reason it makes the perfect bookmark for this collection is that it bears the image of Banjo Paterson, with a sketch in the background of the ride from “The Man from Snow River.” The fact that Paterson is on the money might suggest to non-Aussies the cultural significance of this poet. While a lot of his poems are gloriously evocative, Paterson also occasionally revealed in his work a classic element of Australian humor: hyperbole. When things are rough, you exaggerate. In fact, Australian humor is kind of a blend of the wild exaggeration one finds in classic tall tales of the American west and the very dry wit of the British–but all modified and a bit twisted by the wonderful peculiarities of Australia itself. One example of this hyperbolic humor is the following Paterson poem, published in the late 1800s. Interesting to note that it ends with ghosts being heard–since that’s how the even more famous Paterson poem, “Waltzing Matilda,” also ends. For their cultivated owners only rode ’em once a week. A spectator’s leg was broken – just from merely looking on. Was the last surviving player – so the game was called a tie. So he struck at goal – and missed it – then he tumbled off and died. He’s been haunted by the spectres of the Geebung Polo Club. Thomas Keneally is great at capturing telling moments, poignant details, emotional impact, and he’s exceptionally good at transmitting them to the reader. Who wasn’t impressed with Schindler’s List? Keneally writes a lot about history, but he also writes a lot about his native Australia, and in his book Outback, he captures so much of the essence of the country’s rugged interior that it has become one of my favorite books about Australia. Keneally writes in the book’s forward, “It is as if in the immensity of outback Australia, people’s temperaments expand like yeast to occupy and give point to the immensities of space. It is hoped therefore that in these pages you will visit an enchanting and unknown country whose customs, secrets, ironies and landscapes you could not previously have guessed at.” Because I’ve visited that enchanting country, I can attest to the accuracy of Keneally’s observations, at least as far as the wonder of the land and friendliness of the people. 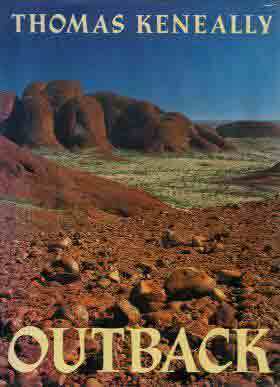 Outback is out of print now, or at least it’s not carried on Amazon, but there appear to be scads of people selling second-hand copies. If you’re interested in Australia, I encourage you to track down a copy. You would find them mighty rivers with a turbid, sweeping flood. And the men who know the bush-land — they are loyal through it all. Did you chance to hear a chorus in the shearers’ huts at night? Did they “rise up William Riley” by the camp-fire’s cheery blaze? Did they rise him as we rose him in the good old droving days? Were their faces sour and saddened like the “faces in the street”? Than the little city urchins who would greet you with a curse? In a filthy, dirty attic toiling on for daily bread? Than the roar of trams and buses, and the war-whoop of “the push”? For you say you’ll stay in townships till the bush is civilized. Where the “blokes” might take their “donahs”, with a “public” close at hand? For the bush will never suit you, and you’ll never suit the bush. A lot of folks ask me about traveling solo, especially in Australia–which amuses me only because Australia must be the easiest place on earth to travel solo, at least if you speak English. People are friendly and helpful. You don’t have a lot of political unrest. Crime is low. Food is safe (and, in many instances, spectacular). Unlike the US, Bed & Breakfast places are usually a bargain, and there are myriad accommodations at even lower prices, from backpacker cabins to low-cost hotels. Plus Aussies are keen on seeing their own country, so there are loads of great tours that will carry you into even the remotest parts of the continent–and supply the tent, sleeping bag, and other gear needed for such adventures. I’ve traveled alone lots of other places, and while large urban settings are pretty easy to negotiate while traveling solo, from London to Istanbul to Beijing to Tokyo, I haven’t been anywhere else where the countryside is so easily accessed, even by those on their own. Driving on the left is a bit of a challenge for an American, but the roads are generally good, and I’ve found accommodation ranging from pleasant to quite wonderful even in the smallest of towns. And because there are a lot of solo travelers, you can often find places in popular destinations that have rooms for singles. Granted, I have a rule about going into trackless wilderness–don’t do it without a guide–but in Australia, guides into the trackless wilderness areas of the continent are multitudinous and generally reasonable priced. Also, as noted above, they supply the gear, so you don’t have to worry about overweight luggage on the flight over. If you don’t want to drive, Greyhound and Ansett buses cover the country well, plus there are trains and airplanes, of course. (And if you’re coming from the US, you can get discount passes for just about all of these.) Public transportation is good in the cities–and I actually prefer public transportation when I’m in crowded urban areas. The friendliness of the locals is not to be underestimated as a factor in happy solo travel. I travel alone because I don’t always have anyone to travel with, not because I’m antisocial, so I’m delighted that, in Australia, people will sometimes invite you to join them when they see you’re on your own. In restaurants, some will just come over to your table and ask how you are and what you’ve been up to, and depending on the level of interest you express, will pull up a chair and chat for a while. This is usually other solo travelers, but is also sometimes someone who works at the restaurant. I’ve stayed at B&Bs where, because I was the only guest, they invited me into the kitchen with the family, rather than leaving me alone in the dining room. So of all the places I’ve been in the world, I’d say Australia is probably most ideally suited for solo travelers. It’s so open and welcoming, but it’s also easy to get around. Hope this removes your last excuse for not going! I am often asked when and/or how my interest in Australia got started. As with so many of my interests, it started with books. Between his service in the military and his career in business, my dad had gotten to know a fair number of Australians, and as Australians are great book lovers, books were what they most often sent as gifts. The one I remember most vividly was a magnificent volume titled The Australians, with gorgeous photography by Robert Goodman and wonderfully crafted text by George Johnston. It came out in 1966, and today you can only find it in secondhand shops, but during my childhood and into adulthood, I returned to it often. I’m sitting now, flipping through the book, and smiling that I have visited so many of the places that captured my imagination when I was a youngster. Many other books followed, but it was about 10 years later that I saw the first images that suggested to me that Australia was actually a potential travel destination. John Denver shot a TV special in Australia, and he took a gaggle of celebrities on a tour to some of the most interesting places. Among those places, the one that was burned into my memory from that program was Ayers Rock/Uluru. It was many more years before I finally got to the place where I needed Australia–really needed to go and explore it for myself–and understood that it was okay to go. That was the trip, of course, that changed my life, the trip that became my book Waltzing Australia — the reason people ask me how my interest in Australia got started. I like to think that someday, someone else will be asked how their interest in Australia got started, and that for someone, it will be with my book or my blog. We’ll see. Anyway, John Denver really liked Australia, so he went more than once. In fact, the John Denver CDs in my collection were purchased in Australia– which means they have songs that I don’t think many folks in the United States have heard, including Sing Australia. It’s not my favorite John Denver song (hard to pick a favorite, though if I had to, I’d say Calypso), but it’s definitely the most Australian of his songs. Here, it is presented with a nice slide show of Aussie images.